Friday night - did not go out for dinner as it was raining. Would not be convenient to go out in a rainy weather with a baby around. Hubs cooked simple bihun soup, that was all (sorry, picture not taken, but yes, my hubs cooks). Saturday - went to Jusco, Cheras Selatan in the afternoon for some grocery shopping, then headed to the in laws as usual for dinner. 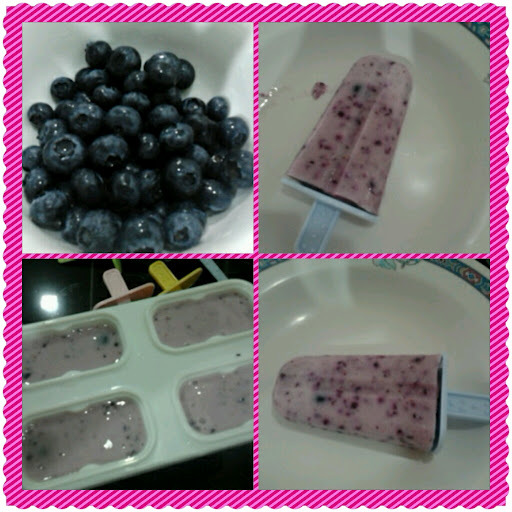 At night, I made blueberry yogurt ice lollies. While that was freezing away, I decided to make a cake. Yes, a cake, just for two. 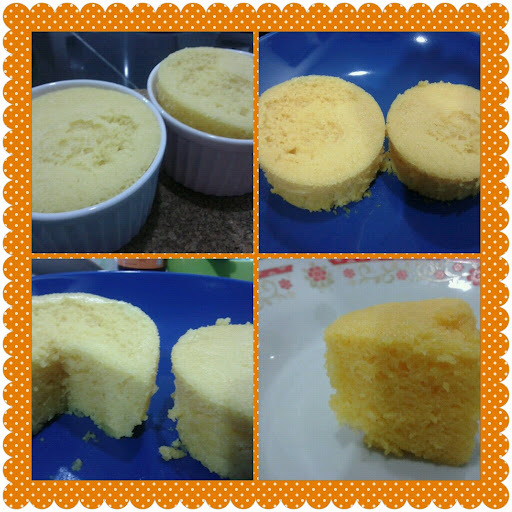 Steamed orange lemon zest cake - my version. Simple and fast since it was just steaming. Mix everything together and steam for half an hour. Then you will get a somewhat moist-in-the-middle-cake. Easy peasy! Hubs love it and gave me a 9.5 rating! Where did the 0.5 go? Hubs said it was too sweet. Oh well, yeah, because there were both sugar and Sunquick orange concentrate in the cake. We had the cake for supper and after that I went to check on my ice lollies. Nope, not set yet. Need to wait til tomorrow to taste it. Blend fruit, yogurt and icing sugar. Mix with gelatin. Put in the lolly mould. Freeze. Sunday - The naughty boy wokeup at 7am! I wonder whether he gets enough sleep in a day. He seems to sleep so little, sigh. Anyway, my parents came around 9.30am. Left around 11.30am. That little rascal had his milk after they left, and zzz from 11.45pm until 2pm! He must be so tired . 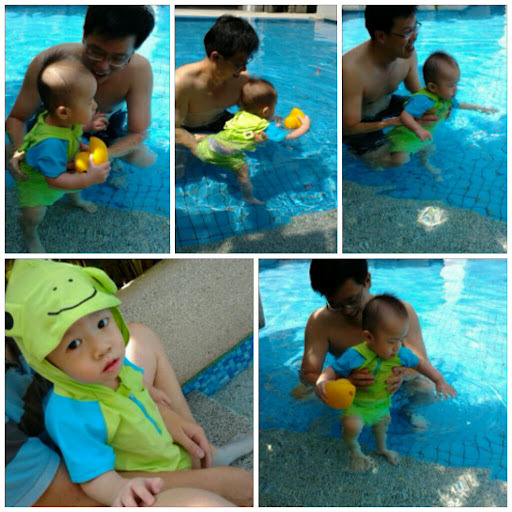 After his lunch and some rest, we took him to the pool in the afternoon around 2.30pm. It was his first time going to the pool. We spent about 15 minutes at the pool. In the evening after Kz wokeup from his nap we went out for dinner. Hubs suggested Korean food. We went to Seoul Fusion in Bukit Jalil. Food was ok. I'm not a fan of Korean food. To me, they are full of veges only such as cucumber, carrots, onions, mushrooms and more mushrooms, taufu, crabsticks, etc. 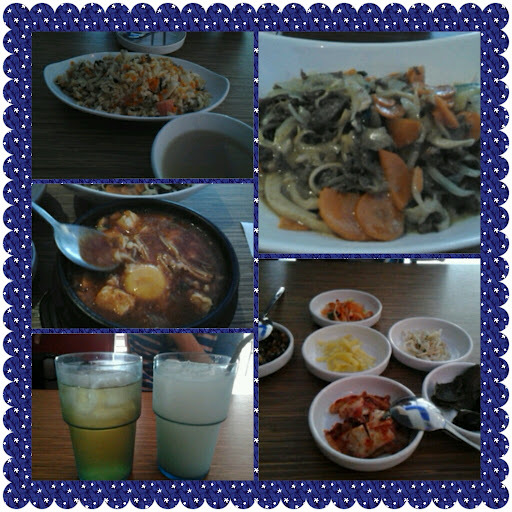 Anyway, we had beef bulgogi with cheese, seafood sun-dobu soup, seafood fried rice, milk soda and herbal lemon tea. The beef bulgogi was yummy though. I can eat two bowls of white rice with that. There goes my precious, happy weekend again. Monday soon again, folks! P/S: I have a lot of work sitting on my desk, from some stupid fools. Mostly from the Biatch and SissyJammy. But I just don't feel like doing any of it.